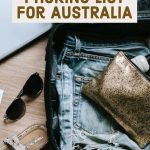 What essential things should you take when travelling to Australia? I’m often asked what I take with me on my trips to Australia. 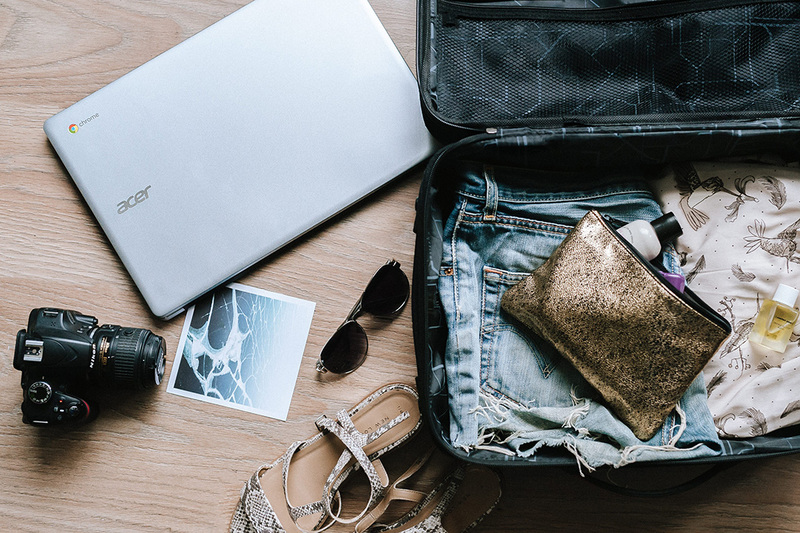 Most people don’t really seem to think twice about packing for the average two week holiday, whether they travel light or take the kitchen sink. However, throw in an extra week or two and it can start to get a little more complicated. Can I take (or carry) enough to cover my whole trip? What should I take? Where can I wash clothes? Backpacking taught me we actually need very little when travelling, not least because I can’t carry much (thank god for backpacks on wheels – they do exist). However, now I’ve upgraded from hostels to hotels I’m always trying to find the balance of taking what you need for a comfortable trip but still being able to get around easily. If you are doing a whistle-stop tour of Australia you definitely don’t want to be carting loads of stuff around with you. Packing and unpacking gets more than a little tedious after a few days (trust me). 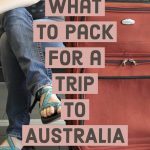 So here is my complete guide of what you should pack for a trip to Australia. These things should be sorted long before you head off to the airport. The last thing you want to be doing in the last few days before your trip is running around checking passports and visas or buying travel insurance on the way to the airport. Passport: check it is still valid. You don’t want to get to the airport to find out they won’t let you on the flight or into the country. Visa: you need a visa to visit Australia so you definitely don’t want to be leaving that till the last minute. It’s quick and easy to apply for. If you are European an eVisitor visa is available that allows you to visit Australia as often as you like in a 12-month period for stays of up to three months. Travel insurance: not the most exciting thing to organise but one of the most essential. Make sure your travel insurance covers your whole trip and any activities you may wish to do (watersports, winter sports, sky diving etc). Your tech: update your smartphone, laptop or tablet with your favourite films/tv shows/music. Make sure they play without an internet connection. Trust me there is nothing worse than getting on a 12-hour flight to find all your entertainment is stuck in the cloud. Contact details: leave details of your travel plans with a relative or close friend. Particularly important if you are travelling solo. Medical supplies: if you are an on medication make sure you have enough to get you through your travels. It’s also worth having a copy of your prescription with you just in case. Packing cubes: once you’ve used these you’ll never look back. Makes organising your case so much easier. I love long-haul flights, there is nothing better than being able to switch off for a few hours. That said they are not always the most comfortable of journeys. Well for those of us in economy! So to try and make it a little easier here is what I always take on board with me. Reusable bottle of water: saves you keep having to get up for a drink or calling the flight crew. Snacks: the less said about most airline food the better. Take some of your own snacks just in case. Reading material: stock up on books and magazines or download lots of books to your Kindle/smartphone. Large wrap/pashmina: I know most airlines offer you a small blanket but I always think using your own is cosier. USB cable: lots of long-haul flight these days come with USB sockets in the seats so you don’t have to worry about your phone running out of battery before you reach your destination anymore. Moisturiser and lip balm: those long-haul flights can really take it out on your skin. Glasses: once up in the air I switch from contact lenses to glasses to avoid dry eyes (and from waking up thinking a miracle has happened and I can see again). Smartphone: these days your phone is your camera, travel guide, map reader and entertainment centre. Don’t travel without it. Spare battery charger: although most smartphone batteries are pretty good these days it’s always worth having a spare battery charger. You don’t want to get to the end of a long day sightseeing to find you have no battery left to take photos or to use a map to find somewhere to eat. Power adapters: depending on where you are travelling from you may need a travel adapter. Also, if a few of you are travelling together it is worth picking up an extension lead. There are never enough plugs in hotels rooms for everyone’s tech… or hair straighteners! Camera: whether you are a serious photographer or not if you are taking that once in a lifetime holiday or dream long-haul trip then take a proper camera. Smartphones take great photos nowadays but nothing beats a proper camera. Laptop/tablet: most hotels have computers you can use or there is usually an internet cafe not too far away but laptops/tablets are so light these days it’s more convenient to have your own with you. USB stick (or portable hard drive): backing up to the cloud isn’t always that easy or practical while travelling. It can be hard to get a decent connection and can take ages to upload. So having a USB stick or portable hard drive means you can back up photos and other information safely and easily. SIM card: if you are spending a few weeks in Australia, look into getting a local SIM card. It can often be cheaper than using your own one. If I’m Oz for more than 2-3 weeks then I usually by an Aussie SIM card. 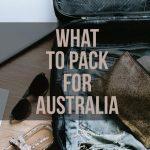 While I have been known to chuck some clothes into a suitcase an hour or so before heading to the airport (even for a month in Australia), I do try to have some kind of checklist for packing. Light rain jacket – believe it or not it does rain in Australia sometimes. You might not believe it but it can get cold in some parts of Australia in winter – Melbourne I’m looking at you! So if you are heading to Australia then make sure you add a few warmer clothes to your case. Obviously, you can pick up toiletries in Australia but unless I’m really trying to cut down my luggage or my case is ridiculously heavy I usually take a few favourites with me. 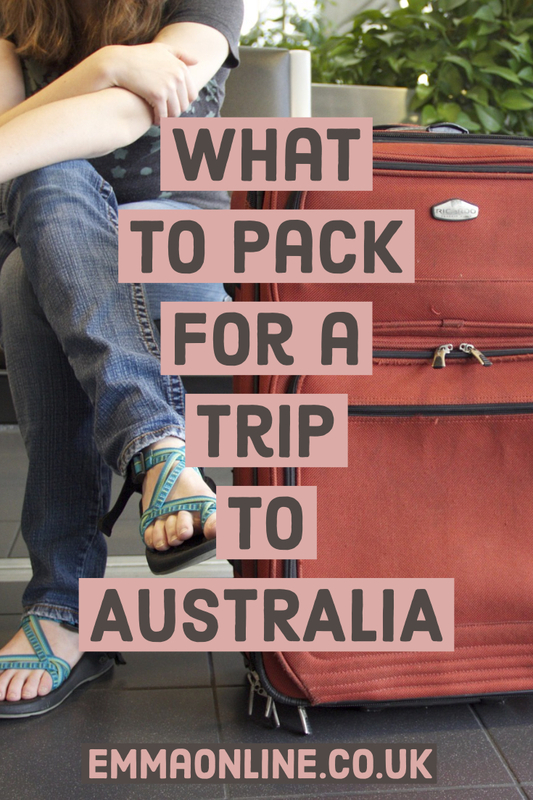 My first trip to Australia was when I was backpacking which brings it’s own set of packing challenges. I thought I had packed light but ended up sending home a box of stuff within two weeks of arriving in Australia. You quickly realise the less you have the easier it is to carry around! So if you are going backpacking try packing a few days before you leave. Then halve it. And maybe halve it again! 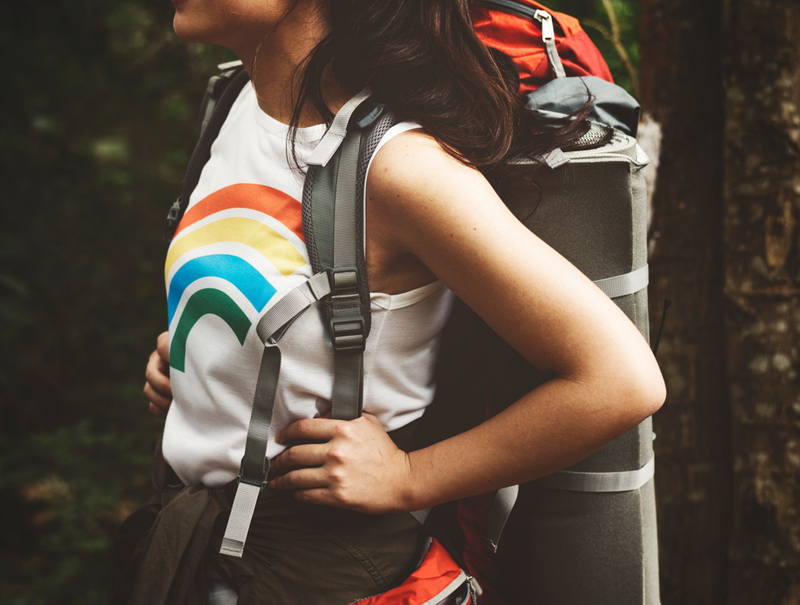 Most of the items in the list above are still relevant if you are backpacking (though perhaps on a smaller scale) however, there are a few more items you should consider packing. You’ll likely be in hostels most of the time so you’ll need to be a bit more self sufficient than if you were in a hotel. Here are a few backpacking essentials. So that is my list of essential things to take to Australia. Have I forgotten anything? What are your travel essentials? Or do you have any packing hacks? Let me know in the comments below. Looking for more information on Australia? – Offline maps on my (Android) phone. – A wireless router with a local SIM card. Was extremely handy in Japan and NZ.